VW cars are parked outside a VW dealership in London. 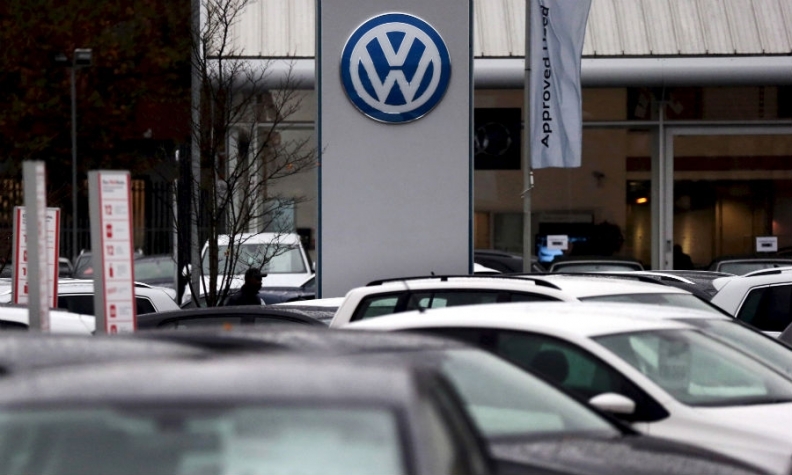 A bigger financial threat to VW than EU regulatory fines may come from private litigation. BRUSSELS (Reuters) -- Volkswagen said there were no grounds to replicate in Europe a compensation program it plans for U.S. drivers affected by its diesel emissions scandal, rejecting a demand from the European Union's industry commissioner. VW said it was paying compensation in North America because it had yet to agree with local regulators how to fix affected vehicles, and so customers there would have to wait longer for a solution than elsewhere. VW admitted in September it had cheated U.S. environmental tests by using software to mask nitrogen oxide emissions that can cause or exacerbate respiratory disease. It added that up to around 11 million vehicles worldwide could have had the software installed, including about 8.5 million in Europe. In the United States, VW has promised goodwill compensation worth $1,000 each to tens of thousands of owners of VW vehicles that breach emissions limits. Last week, EU industry commissioner Elzbieta Bienkowska wrote to VW CEO Matthias Mueller with a list of demands, including that he consider compensation for affected VW drivers in Europe. "We are concentrating in Europe on the repair and service process," VW said in a statement on Thursday following a meeting between Mueller and Bienkowska in Brussels. "The situation in the USA and Canada is not automatically comparable with other markets in the world," it said. "Therefore this action (the compensation scheme) cannot simply be rolled out in other markets." The European Commission said in a separate statement after the meeting: "Commissioner Bienkowska invited the group once again to reflect on adequate ways to compensate consumers." "She repeated her clear view that EU consumers should be treated in the same way as U.S. customers. Mr Mueller agreed to come back to the Commissioner on the points discussed," the statement said.